Boot organization and storage is our passion and livelihood; we live, breathe, sleep and think about boots constantly. Boots are—as anyone and everyone who owns even one pair knows—a unique organizational challenge. Unlike shoes, boots come in an enormous plethora of shapes and sizes. There are the smaller and shorter ankle booties that are so popular this fall season; the ever-popular knee-high boots that are always in style; cowboy boots, which are both sturdy and always fashionable; mid-calf boots that look great in both cold and warm months; and finally, for the more fashionably adventures, thigh-high boots. 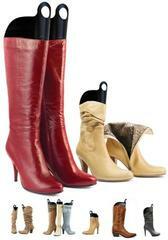 And all these different types of boots come in a glorious gamut of materials, colors, and styles. Which is fantastic for fashion, but can present a storage and organizational challenge. Our Boot Butler solves many storage challenges, and we’re very proud of its design: It holds multiple pairs of boots, can be customized to your particular closet space and is really good for your boots health and shape. 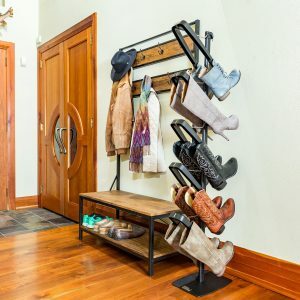 We’re also aware that ours isn’t the only product on the market, and so in September, we put together a roundup of 8 boot storage products—racks and hangers—to help you determine which best suits your needs. This month, we’ve brought you another roundup. 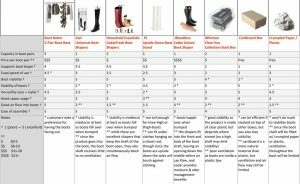 This time, we look at 8 more products for your boots and are focusing on boot shapers and other types of non-rack storage. We believe in fairness and accuracy, so used the following criteria to assess each product. We researched the product websites and read through Amazon reviews to get the most accurate sense of customer feedback. We’ve put together a table where you can contrast and compare the various products, and then a detailed listing of each product below that. The product can be used on how many pairs of boots? How efficiently does the product store the boots? For this particular criteria, we used 21″ high boots (a typical knee-high boot) as an average. Does the product support the natural shape of the boot? Does the boot shaft stay upright, or does it crumble? Because no one has a lot of time to waste on accessing their boots, or putting them away. Can you see the boots at a glance? Or does it take you a while to access which boots are where? Boots can weigh quite a bit, especially if they have wooden heels. This criteria examines whether the product holds the boots well, and also—how well the boots stay upright versus toppling over at the slightest touch. An average boot owner will have multiple types of boots, and these can range from ankle-height booties to thigh-highs. We note how versatile each of the products is on a wide range of boots. Pros and cons and everything in between. 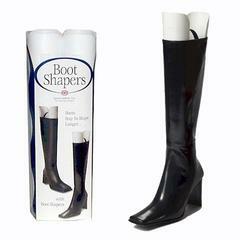 These boot shapers offer excellent shaping and have good visibility and ease of use. You can either hang the boots from a hook on a closet rod or leave the boots on the floor. Customers report that they are not tall enough for knee-high boots, and offer little to no stability so that boots fall over when touched. When hung, they are very inefficient as they leave lots vertical closet space wasted underneath. Customers also say that the boots aren’t very secure when hung. Some customers note concerns and rare instances of the boots stretching. Quality is mediocre with some customers complaining of them falling apart shortly after purchase. This is a boot shaper that you insert into the boot log, supporting its natural shape. It’s easy to use and the flexible frame fills the bootleg, so it’s versatile for different kinds of boots. The product doesn’t organize boots, and doesn’t offer much stability—customers report that boots fall over every time they’re bumped. Additionally, there’s nothing cedar in this product—it’s sadly made completely out of plastic. 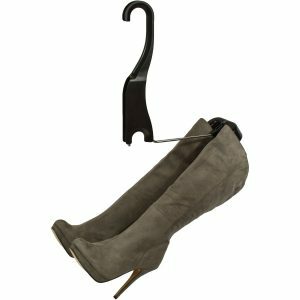 This upside down boot stand has high marks for stability, and you can place it underneath your hanging clothes (though the soles face up). You can also stand it up on a shelf if you have the height for it. 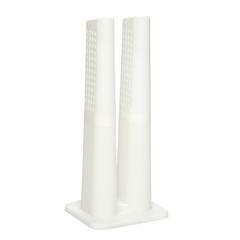 The boot stand offers good organization, good visibility, good access and ease of use. It also offers good shaping—meaning that the design allows for the boot to be stored in a natural shape. Downsides include poor ventilation into the boot shaft. It’s not tall enough for knee-high boots or taller, the soles face up, and it’s not a very efficient use of space. Unlike the product directly above, these boot shapers are made of cedar, which means that they’re high-quality, and help with both odor and pest-control. They offer excellent shaping and are very easy to use. Cedar is a very high-quality wood, so this product can be pricey. This is a boot shaper, so not a product that will organize the boots. Stability is poor, meaning that boots will topple over when bumped. This clear plastic box has a vent at the bottom for ventilation. It offers good protection from dust and is inexpensive. The product has good to fair visibility. You can stack multiple boxes on top of each other. If you do have many boxes stacked on top of each other, getting to a particular one might be a bit troublesome (especially if it’s all the way on the bottom, or at the top of a very tall stack on a very tall shelf!). Customers report that the closure tabs can break, and need to be handled gently. For an inexpensive shaper, you can use crumpled paper. Avoid newsprint, as it can rub off on the insides of your boots and leave stains. Yes, and we do mean the box your boots came in. The pros are obvious: You know that your boots will fit into that particular box. You don’t have to buy or purchase anything else, and you can stack multiple boxes on top of each other. Cardboard doesn’t offer you any visibility into what’s inside that box, so either label the box clearly, or tape a Polaroid so that you can see at a glance what’s inside. The cardboard will also most likely disintegrate long before you are done with the boots. You’ll need to stack the boxes to get decent space usage, which makes accessing your boots very frustrating. 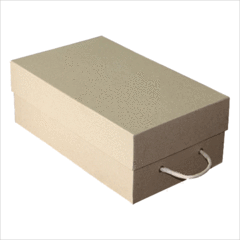 Additionally, the boxes provide no support for the boots shape and poor ventilation. Last but certainly not least, we’re going to take a look at our Boot Butler as a better boot storage alternative to shapers and boxes. The Boot Butler is an excellent organizational tool for your boots, as they remain fully visible when hung up. Boots are easily accessible both when taking them off and putting them back on the Butler. Efficiency-wise, the Boot Butler has excellent space usage; you can fit up to 5 pairs of boots in a slim vertical footprint, taking advantage of the entire height of the closet from the top of your closet rod. Our product cradles your boots from the inside and is gentle on the boots—nothing is pinching or otherwise affecting the boot shaft—and it supports the shape of the boots keeping the shaft nice and straight and crease free. Our Boot Butler is easy to put together, and it’s also adaptable: Hang 5 boots in one vertical row, or split up the Butler into various horizontal configurations to hang from a double hang closet rod or using a closet doubler. The Boot Butler is pricier than many other competitors. It also occupies closet rod space—not something all customers can spare. If you choose to put the Butler into your clothing closet, boots will hang next to clothing. Keep in mind that the maximum boot height the Butler can hold is ~22”. And that’s all she wrote, folks! Which of the above boot storage products have you tried? Which would you like to try out? Have we missed any products that you use for storing your boots that should be added to our list?